Thanks to our financial position, we are able to continue to invest in our networks and grow the business. This in turn enables us to pursue our strategy and to play a facilitating role in the energy transition. Our financial policy is essentially aimed at maintaining a solid A rating profile as a minimum. There is evidence that sustainability considerations are an increasingly important part of the deliberations of shareholders and other investors alongside sound financial policy. Alliander supports this and the company's sustainability targets are therefore playing an increasingly prominent role in the management of the business and external financing. This development has allowed us for the first time to issue green bonds whose proceeds will be used exclusively for sustainable investments. Alliander's financial framework is formed by the FFO/net debt, interest cover, net debt/net debt plus equity and solvency ratios. These ratios, coupled with the norms against which they are measured, are crucial in obtaining and retaining a solid A rating profile on a stand-alone basis. In a departure from IFRS, when calculating the ratios, the subordinated perpetual bond loan issued in 2013 is treated as 50% equity and 50% debt. The classification of Endinet group as 'non-current assets held for sale' (IFRS 5) was ignored when calculating the 2015 ratios. 1 The funds from operations (FFO)/net debt ratio is the 12-month profit after tax adjusted for deferred tax movements and incidental items and fair value movements plus depreciation of property, plant and equipment and amortisation of intangible assets and accrued income, as a percentage of net debt. 2 The interest cover ratio concerns the 12-month profit after tax, adjusted for the movements in the deferred tax assets and liabilities, incidental items and fair value movements, plus depreciation of property, plant and equipment and amortisation of intangible assets and the net amount of finance income and expense, divided by net finance income and expense adjusted for incidental items and fair value movements. 3 The solvency ratio is obtained by dividing total equity including the profit for the period by total assets less deferred income. As at 31 December 2016, the FFO/net debt ratio amounted to 26.6% (year-end 2015: 28.1%) compared with a required minimum of 20%. The decrease is mainly accounted for by a lower operating profit as a result of lower prices and higher sufferance tax levies. As at 31 December 2016, the interest cover ratio worked out at 8.3 (year-end 2015: 7.6). The decrease is mainly accounted for by lower interest expense. Alliander's financial policy stipulates that this ratio should be a minimum of 3.5. The ratio of net debt/sum of net debt and equity as at 31 December 2016 amounted to 32.6% (year-end 2015: 34.3%). Alliander's financial policy stipulates that this ratio should not exceed 60%. The solvency ratio as at 31 December 2016 amounted to 58.5% (year-end 2015: 55.7%), compared with a minimum of 30%. The rise compared with 2015 is mainly due to an increase in shareholders' equity relative to unchanged total assets excluding capitalised construction contributions. The dividend policy (as part of the financial policy) provides for distributions of up to 45% of the profit after tax, adjusted for non-cash incidental items, unless the investments required by regulators or financial criteria demand a higher profit retention percentage and unless the solvency ratio falls below 30% after payment of dividend. The investment policy is consistent with the financial policy and is part of Alliander's strategy. Elements of investment policy include compliance with regulatory requirements relating to investments in the regulated domain, such as safety and reliability and the generation of an adequate return on investment. Ordinary investment proposals are tested against minimum return requirements and criteria as set out in the financial policy. Innovative schemes require specific Management Board approval. As well as quantitative standards, investment proposals must also satisfy qualitative requirements. It should also be noted that, in principle, investments in the regulated domain arise from a network operator's statutory duties. Alliander pursues an active policy of maintaining an open and constructive dialogue with shareholders, bondholders, financial institutions, credit rating agencies, sustainability rating agencies, analysts and the media. We try to provide all stakeholders with relevant financial, sustainability-related and other information as accurately and promptly as possible, in reports, in press releases and in meetings as well as by other means. All of Alliander's shares are held directly or indirectly by Dutch provincial and municipal authorities. A full list of the shareholders can be found on www.alliander.com. The authorised share capital of Alliander N.V. is divided into 350 million shares with a nominal value of €5 each. All the shares are registered shares. As at 31 December 2016, there were 136,794,964 issued and paid-up shares. Contact with shareholders primarily takes place in shareholders' meetings. However, Alliander also believes that it is important to have contacts between the company and its shareholders outside of the shareholders' meetings, on a bilateral basis or in a wider forum. A summary of the various shareholder dialogue structures can be found on the Alliander website. Alliander issued green bonds for the first time in April, raising €300 million to fund investments in sustainable projects. Asset manager Actiam was one of the subscribers. 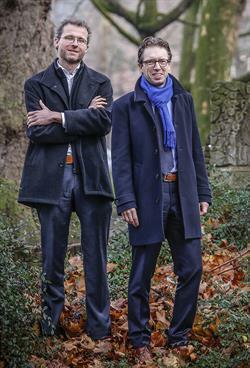 “Green bonds do have to have genuinely green credentials”, say portfolio manager Foppe-Jan van der Meij and ESG analyst Bas Wetzelaer (right and left in the photo). The Management Board has determined, with the approval of the Supervisory Board, to add €178.1 million of the profit to the other reserves. The remaining profit of €103.8 million is at the disposal of the General Meeting of Shareholders. This equates to 45% of profit after tax, excluding incidental items after tax that did not generate cash flows in the 2016 financial year. The dividend for 2016 is up by €18.8 million compared with 2015 owing to the higher net profit for 2016, which was due mainly to the book profit on the sale of Endinet on 1 January 2016. Institutional investors in our bond issues, such as asset managers, insurance companies, pension funds and banks, provide a large part of our financing in the form of debt. These are professional players on the international financial markets. We keep existing and potential bondholders informed regarding the company's financial position and results as well as developments in the industry by actively engaging in investor relations activities in addition to complying with ordinary publication requirements. In this context we held investor conference calls in March and September 2016 which addressed a range of subjects including the method decisions and regulated WACC for the new regulatory period, the impact on Alliander of the exchange of networks between Alliander and Enexis and the consequences of the Senate’s rejection of the Electricity and Gas Bill (STROOM). In addition there was a roadshow in connection with the green bond issue in April 2016 during which we visited investors in Paris, Frankfurt, Amsterdam and London to explain Alliander’s sustainability policy and the projects to be financed. The amounts scheduled for repayment in 2019, 2022, 2024 and 2026 mainly relate to the bond loans. The other amounts relate to the repayment of shareholder loans and other loans. Alliander has a €3 billion EMTN programme. In April, Alliander issued €300 million of new 10-year bonds at a coupon interest rate of 0.875%. This was the first time Alliander has issued green bonds. These are bonds whose proceeds have to be used exclusively for sustainable investments. The proceeds from these green bonds were used mainly to refinance investments in smart meters and the sustainable redevelopment of the office in Duiven. As at 31 December 2016, the carrying amount of the outstanding bonds was €1,394 million (nominal value €1,400 million). Alliander has available an ECP programme totalling €1,500 million which can be used to issue short-term debt instruments. The euro equivalent of this amount has been fully hedged. As at year-end 2016, ECP loans with a face value of €75 million were outstanding. In July 2016, Alliander renewed its existing committed €600 million back-up credit facility on favourable terms. The facility was contracted with a group of six banks including two new banks. The new facility runs until 29 July 2021 with one-year renewal options up to July 2023 exercisable in 2017 and 2018. As in previous years, this facility was not drawn on during the year. During the reporting period, Alliander was in contact with the rating agencies on several occasions. These contacts covered such things as the regulatory system and the exchange of networks with Enexis. The annual reviews took place in October and November. Based on the recent financial performance and forecast figures for Alliander presented on these occasions, S&P reassessed Alliander's creditworthiness and confirmed the existing ratings and outlook. Moody's has reaffirmed the ratings the end of July following the published draft method decisions.